Roots of 28 species of epiphytic vascular plants were collected on tree trunks and branches at six afromontane forest sites between 1700 and 3300 m above sea level in Bale Mountains National Park, Ethiopia. 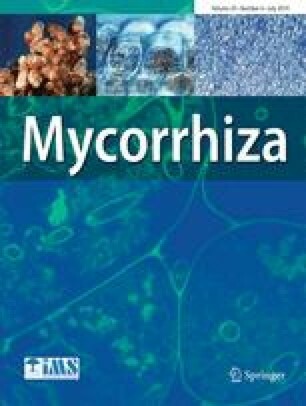 Seven of the 28 epiphyte species were colonized by vesicular-arbuscular mycorrhizal fungi (VAM). Mycorrhizal colonization only occurred at two of the six sites examined, at 2900 m and 3300 m, but more than one type of VAM endophyte was present in each case. Three facultative epiphytic species were all highly colonized by VAM on the forest floor, whereas roots from epiphytic habitats were weakly colonized. No correlations were found between VAM colonization, fine root diameter and root hair length, but VAM colonization and root hair abundance were negatively correlated. The lack of VAM colonization of potential, epiphytic host species at the majority of the sites examined points to the dispersal of VAM propagules as the factor limiting mycorrhizal colonization of epiphytic habitats. It is suggested that root systems of hemiepiphytic tree species serve as corridors between forest floor and tree trunks through which VAM may spread via hyphal growth.